The 11 mile Cades Cove Loop Road is open daily from sunrise to sunset, but the road is closed to vehicular traffic every Wednesday and Saturday morning until 10 AM from early May to late September. The good news is that during this time, visitors are allowed to bike or walk the roadway without concerns of motor vehicles sharing the road! Therefore, we recommend getting an early start on these weekdays if you would like to bike the entire loop. Traffic is often heavy during peak tourist season and on weekends throughout the year, so be sure to use pullouts when stopping to view wildlife and enjoy the scenery. We recommend allowing a minimum of two to four hours to tour the Cades Cove loop. A highlight of any trip to Cades Cove is the Cades Cove Visitor Center, which is located at the halfway point of the loop road in the Cable Mill historic area. Although you can purchase an inexpensive self-guided tour booklet at the entrance to the road, the Cades Cove Visitor Center offers additional books about Great Smoky Mountains National Park. Other items found at the Visitor Center include souvenirs such as t-shirts and keychains, as well as homemade jellies and jams. The Cades Cove Visitor Center is open daily (except Christmas) from 9 AM, with closing hours varying throughout the year. There are many trails that start along Cades Cove, including a 5 mile loop trail that leads to Abrams Falls and the Cades Cove Nature Trail. There are also longer hikes that begin within Cades Cove, including the Rocky Top and Thunderhead Mountain trails. Download the latest official park maps to plan your visit and schedule your time accordingly. Hiking can be a great chance to view the wildlife such as black bears, coyotes, turkeys and whitetail deer that is often seen in the area. 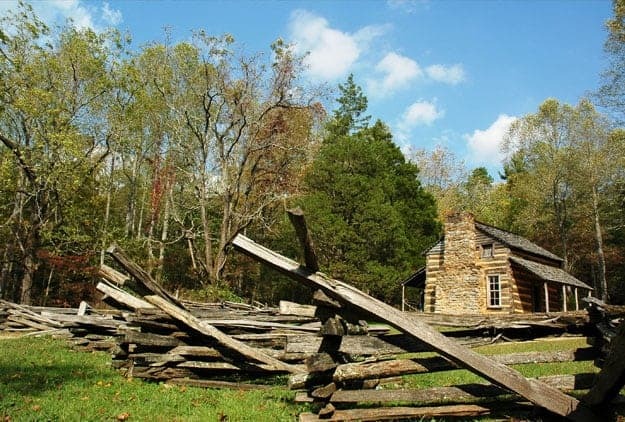 The history of the Cades Cove area dates back to the days of the Cherokee Indians, but the first known settlements were made by Europeans between 1818 and 1821. As a result, Cades Cove contains the largest variety of historic buildings in Great Smoky Mountains National Park. When traveling the Loop Road, visitors will find log houses, barns, a working grist mill and several churches, as well as many restored 18th and 19th century structures. Information about these buildings is available in the tour booklet sold at the entrance to the Loop Road. We hope that you will take the time to check out this beautiful area on your next trip to the Smokies! Click here for more information about more things to do in Cades Cove for your next vacation!